Start Aboard Train #005 (Ulan Baatar to Irkutsk) . . . .
Mongolia - Russia border (Sukhbaatar/Naushki) . . . . Weather: Overcast and cool/cold. Rain in the afternoon that stops by evening. Boarding the train in Ulan Baatar was pretty straightforward - the provodnitsa seemed pretty relaxed and more customer-oriented. After boarding Train #005, we settle into our first class compartment. 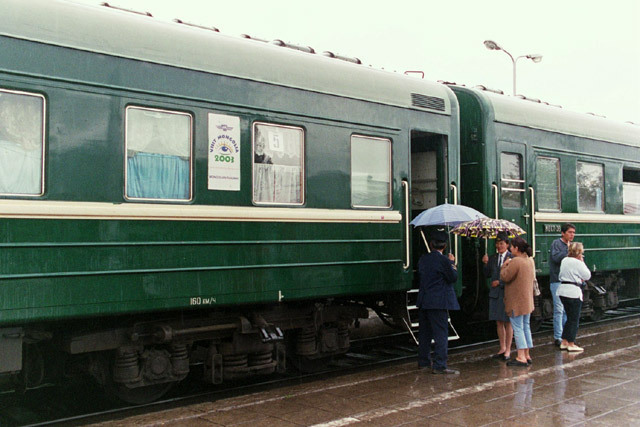 While we had been told that this was a Russian train, it clearly was a Mongolian car that was staffed by Mongolians. 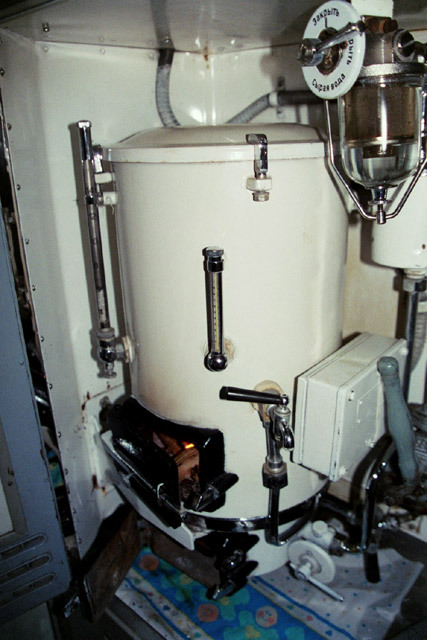 Once again, the samovar was wood-fired. Lars runs out to take a few last minute photos, but the rain limits the opportunities. The train departs Ulan Baatar - KM 404 on time and we are on our way back to Russia. This train travels faster than the train we took to get here, so we will have only one night on board. We are hungry, so we soon prepare our lunch and sit back and relax and enjoy the ride. It is a dreary afternoon, overcast and occasionally foggy, rainy and cold. We are passing through rolling hills covered with meadows. There are few trees. In the middle of the afternoon, just before we arrive at Zunkharaa - 1649 - KM 235, the car attendant brings us some tea and snacks in a package. She tells us it is free. At the station, there are plenty of women who are trying to sell vodka, some what discreetly, but still fairly openly. It is a small station, but a long stop. 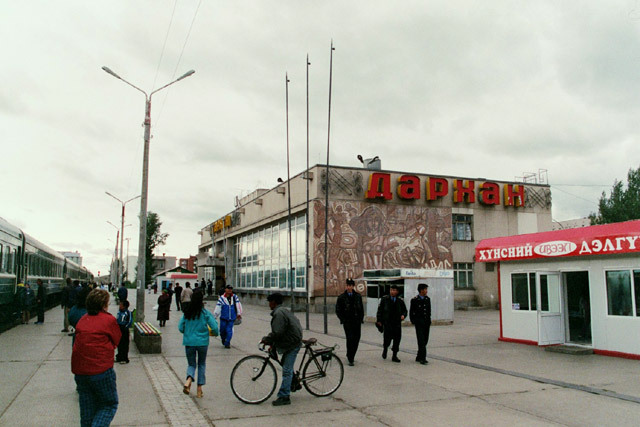 The next stop is a couple of hours later at Darkhan - 1855 - KM 123, a large industrial city with nothing to offer. We go for a quick walk to the back of the train to what is happening, and it this is clearly a train for traders. Just about every compartment is filled with people who are sorting through their goods and trying to stash them away as best as they can in what ever nook and cranny they can find. They appear to be trying to make their stack of goods seem as small as possible. We also come upon one drunk Russian, who we have to carefully navigate by in the narrow corridor. 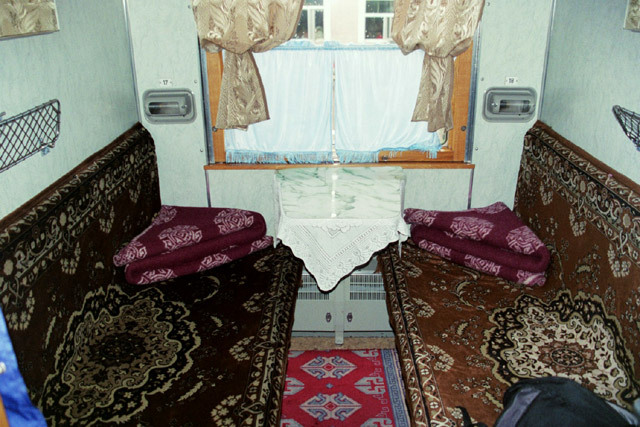 Back at our compartment, we begin to make our own small inroads to the bottle of Chinggis Khan vodka that we have brought with us on the train. A bit rough, but not too bad. Expensive, though, compared to Russian vodka. We finally arrive at the border - Sukhbaatar - 2055 - KM 21 - and the fun begins. We just hope that it will be a bit faster than when we entered Mongolia. The Mongolian officials were quite professional, but they really checked out Lars and his passport and photo. We have never seen anything like this before. They clearly were not sure if Lars was the person described in the passport. The official spent many minutes looking at the photo and at Lars, then gave brusque instructions to "stand" and "look at me". He flipped through all the pages a few times and then walked on, taking our passports with him. He came back about ten minutes later with what seemed to be a supervisor, and he then took another ten minutes to examine the passport and photo and Lars' face. Again, "stand" and "look at me". Had to turn my head left and right. It was so hard to keep from laughing at this whole thing. After a while, the supervisor said something in Mongolian and the other official stamped our passports and gave them back. And this is all while trying to leave the country - you would think they would take more care on the way in. But it does not end there, a women official comes by and also wants to look at Lars' passport and photo and go through the same examination and routine. She seems satisfied after a few minutes. 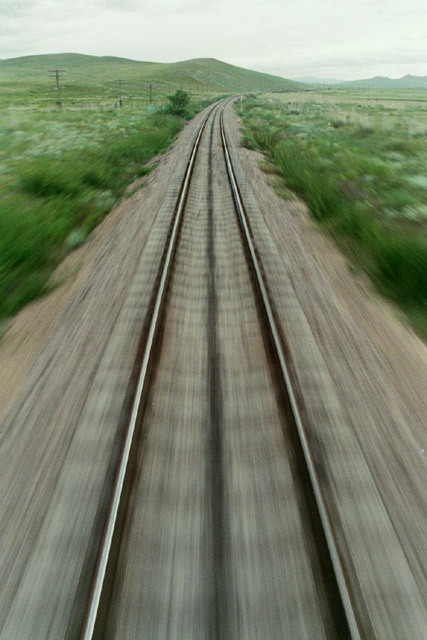 The train departs after about an hour and a half and slowly makes it's way across the border to the Russian border town of Naushki - 2345/1845 - KM 5,902. What a long time we have to spend here - this takes hours. We fill out immigration and customs forms and they take their time coming around and checking everything. Maybe they spend a lot of time with the traders and their goods. They take away our passports and come back a few hours later with them. 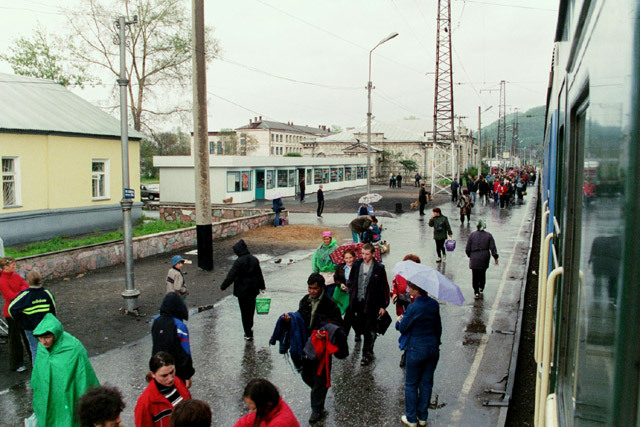 The train finally departs at three-fifteen in the morning - almost four hours after arriving at the Russian side of the border. It is certainly time to go to sleep. Around 9 AM we slowly begin to stir, but spend some more time just lazing in the bunks. At around 10:30 AM we notice that we have arrived on the shores of Lake Baikal. Unfortunately it is overcast and rainy and cold, so the view is nothing special. We have some breakfast. The first stop on the Russian side (at least that we were awake for) is at Slyudyanka 1 - 1255/0755 - KM 5,312/3,977. We hope off to stretch our legs and the vendors, once again, are trying to sell their fish. It is fish, fish and fish. 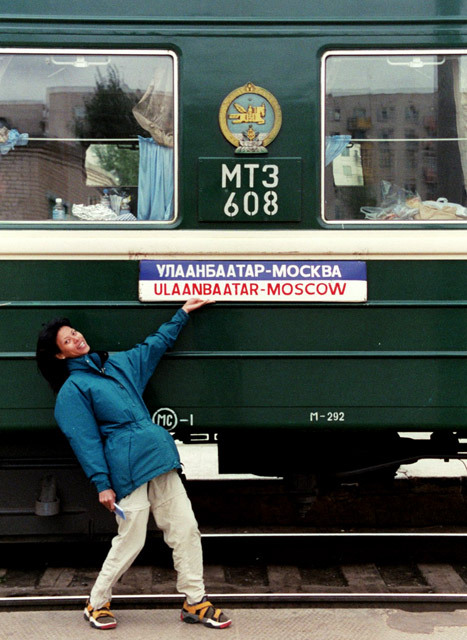 The interesting thing to see are the Mongolian traders get off the train and try to sell some of their wares to the Russian vendors trying to sell their fish. We have a bit of excitement at this station. The train leaves sooner than expected and Lars is just able to hope back on the train as it begins to pull away from the station. But where is Jacqui? She had gone down the platform to look for something to buy, and barely noticed that the train had started to move. Luckily there was still a door open near her, and she was able to grab onto a handle and pull herself onto the train. A close call. We have our lunch in our compartment and spend some time organising our stuff. As we will be leaving some bags behind for a while, we need to take out what we require for a few days. As we are sitting in our compartment, a number of vendors walk up and down the corridor trying to sell their wares. They may as well try to sell as many as possible on the way to market - less to carry. As we watch the countryside pass by outside the window, we notice how wet everything is. It must have been raining for a while. The ground is soaked and swampy and the rivers have all burst their banks and flooded the surrounding areas. This does not look good. We finally pull into Irkutsk - 1510/1010 - KM 5,185/4,104, a bit behind schedule, but glad to be there. We gather up all our things and disembark from the train. We are once again met by Artem, who has arranged a bit of a program for us while we are in Irkutsk.